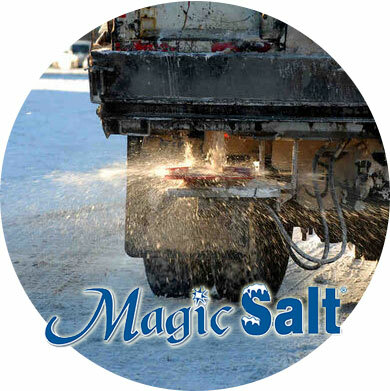 Magic Salt® is a patented liquid treated salt deicer available in granular form. Magic-0™ is a proprietary formula of magnesium chloride combined with an agricultural by-product of the distilling process (i.e. grain and/or sugar based). The liquid treatment is a strong deicer used for pretreatment of parking lots and sidewalks prior to a storm event. Magic-0™ liquid is mixed into a salt pile at the rate of 6-8 gallons per ton of dry salt using a loader. The solid granules are available in bulk for contractors (10 or 25 ton loads) and in pallets of 50 or 25 lbs bags. Area retailers offer Magic Salt® in 50 or 25 lbs bags to the general public. Magic Salt® needs to be stored in dry bags, salt bins or tarped. Magic-0 needs to be stored in food grade plastic drums and totes. One of the safest products in the market, Magic Deicers are less corrosive than distilled water! It is environmentally friendly, safer for pets & children than other deicers, safe on concrete and green concrete, landscaping and hardscaping. It is water soluble, so it is easy to clean. No, in fact, you will save money by using Magic Salt®! It is more effective at lower quantities. It will save you money on time, labor, and equipment, while it reduces downtime, increases productivity, prohibits rust and decreases the slip and fall liability.